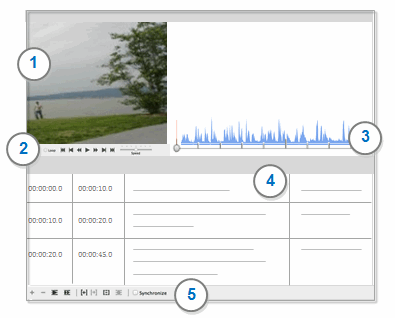 Import your audio or video files and analyze the content in NVivo. 2Player controls—use these controls to play, pause and rewind. 3Media timeline—you can code the media using the timeline. 4Transcript—you can import a transcript or play and transcribe the media in NVivo. 5Transcript and selection controls—use these controls to interact with the transcript or to select a part of the media as it plays. You can also have your media automatically transcribed using the integrated transcription service NVivo Transcription. What type of media files can I import? NVivo for Mac allows you to import media files that have been generated in a variety of ways. You may find that you can import media files generated on other devices and operating systems. video file, you could try converting the file to MP4 format using HandBrake—a free and open-source transcoder for digital video files. audio or video file, you could try opening the file in QuickTime Player, exporting it using the default settings, and then importing it into NVivo. In Navigation View, click the name of the sources folder that you want to import the audio or video into. On the Data tab, in the Import group, click Audios or Videos. Select the file you want to import and select Import. (Optional) Change the name or enter a description of the audio or video source. NOTE If you cannot see the Audio or Video Properties, click the disclosure triangle and then set options for storing the media file—you can embed it in the project or store it outside the project on your computer or a network. NOTE You can import multiple files at the same time. 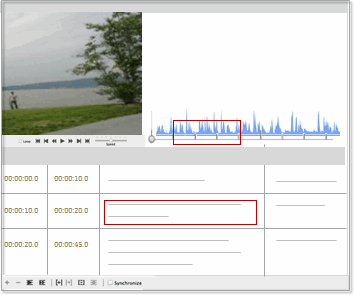 What can I do in an audio or video file? Create a transcript—you can transcribe the media in NVivo yourself, you can import an existing transcript, or you can have your media file transcribed using the integrated transcription service NVivo Transcription. If you don't need a transcript, you can leave it blank. Can I work with the transcript only? You can work with a transcript, even if the audio or video is not available. For example, if you are working in the field and the media is stored on a network drive at the office. When you open an existing audio or video file where the content is not available, you are prompted to work without the audio or video. If you choose this option, the file opens and you can work with the transcript. You can also create an audio or video file without the media content. This is useful in situations where you have a transcript, but do not have the original recording. Where are media files stored? The media content in an imported audio/video file can be embedded in the project or stored outside of the project on your computer or network. Storing media outside of the project is useful when you are dealing with many or very large media files—embedding large files can impact on project performance. If you subsequently move the media file to another location on your computer or network, you will need to re-link it. The way you work with audio and video (coding, linking and annotating) is the same whether the media file is embedded or stored outside the project. Open the file that contains the media file. If you cannot see the Audio or Video Properties, click the disclosure triangle, and then next to Media Location, select Not embedded - file location, then select the folder where you want to save the media file, and then click Export. If your media file is stored outside of your NVivo project, and is subsequently moved to a new location, you may need to 're-link' it in NVivo. In List View, select the source that references the media file. If you cannot see the Audio or Video Properties, click the disclosure triangle, and then under Media Location, select the media file in its new location. If your media files are stored outside the NVivo project (on a CD or network location) there may be times when you do not have the CD or are disconnected from the network. You can still work with audio/video transcript, even if the media is not available—open the source and choose the Work Without File option.